Carlton Cuse Returns To ABC! Carlton Cuse – whose recent hits include Bates Motel and The Strain – is returning to ABC, the home of his biggest hit, Lost. The Golden Globe-winning writer, producer and director has signed a multiyear deal – his company, Genre Arts, will produce content across all network, cable and streaming platforms. Under the Genre Arts banner, Cuse will develop projects and collaborate with other writers to bring their visions to the screen under the new agreement. The Stain’s Therapy Session Straight from SDCC 2017! During Comic-Con 2017, the cast of characters from FX’s The Strain faced an even scarier challenge than losing the world to the Strigoi – group therapy! For the first time, see your favorite characters from the show face their deepest fears – and ask yourself, why does that therapist look so darned familiar? The final season of The Strain airs Sundays (10/9C). FX Taking Archer, Legion & The Strain to San Diego Comic-Con 2017! FX will be bringing the constantly changing Archer, the mindbending Marvel series Legion and the concluding season of The Strain to San Diego comic-Con 2017. Each show will get a panel and Q&A session: The Strain panel will also feature new footage, while the Legion panel will take fans behind the scenes (which ought to be very interesting…) and the Archer panel will feature a surprise guest. San Diego Comic-Con 2017 runs from July 20-23 at the San diego Convention Center. Short But Definitely Not Sweet Teaser: The Strain: Season Four! FX has unleashed a very short, extremely horrifying teaser for The Strain: Season Four. Season Four premieres on July 16th. The final season of The Strain begins nine months after the events of the third season finale. The world has fallen into darkness, and the strigoi are in control. The fourth and final season of FX’s The Strain – based on the trilogy by Guillermo del Toro and Chuck Hogan – will premiere on July 16th (10/9C). Not Your Usual PSA Teaser: The Strain: Season 4! A PSA goes south, heralding the return of FX’s The Strain for its fourth season. FX Renews The Strain For Fourth and Final Season! FX’s The Strain will return for a fourth and final season in the Summer of 2017 – as Guillermo del Tor, Chuck Hogan and Carlton Cuse follow the story of New York city versus the strigoi to its no doubt bloodcurdling end. Read on for details – and a tagline for this week’s new episode. New York City is On Its Own as The Strain Returns in August! FX’s supernatural thrill The Strain returns for its third season with New York City having been abandoned by the rest of the country (giving the old ‘You’re on your own, goodnight’ joke a chilling new level of meaning). Still, the city has Dr. Ephraim Goodweather (Corey Stoll), Abraham Setrakian (David Bradley), Vasiliy Fet (Kevin Durand) and others working to find a way to destroy the strigoi. So there’s that. The Strain returns to FX on Sunday, August 28th (10/9C). For a few haunting hints about lies ahead for our fearless vampire hunters, follow the jump. Fight or Die Trailer: The Strain! A new teaser is available for the third season of FX’s creepy series The Strain. It’s 23 days in and things are looking grim for New York City. Check out the teaser after the break. The Strain returns on August 28th. Behind The scenes of The Strain: Sentient Strigoi! As the FX’s horror series The Strain progresses and we learn more about the human characters, we also learn more about the new levels of the Strigoi – The Master’s vampiric children. In particular, we’re beginning to learn more about Bolivar and Kelly Goodweather – and it’s creepily fascinating stuff. 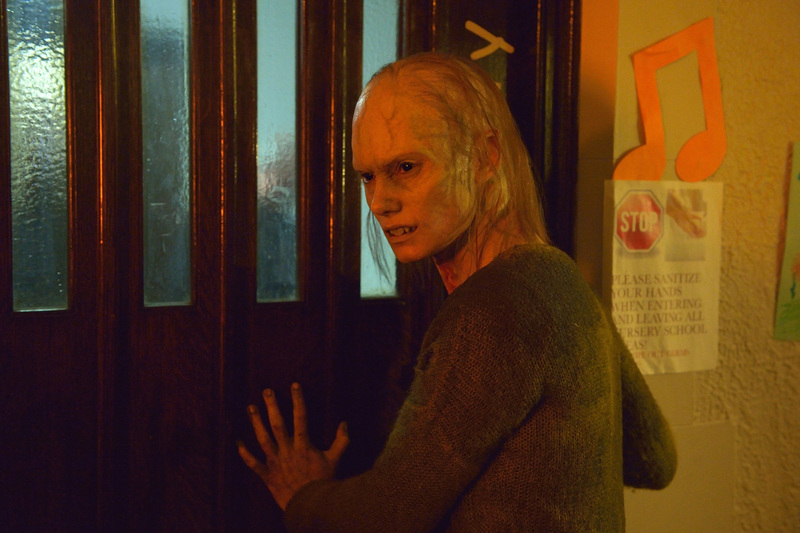 Go behind the scenes of The Strain: Season Two for a look at the sentient Strigoi by following the jump.